A gap in the market. An idea stemming from a personal passion. There are many reasons why people decide to create a new business. All it takes is an entrepreneurial mind, drive and determination. Then, before you know it, you are a business owner and your own success story can begin. In January 2015, Alison Stephenson was working for AAA Property North East, a family-run business specialising in property management and student lettings. Managing a portfolio of properties was extremely demanding. One frustration Alison found herself experiencing was sourcing high-quality, reliable and multipurpose tradesmen who could respond to and complete a growing list of jobs. Alison quickly realised that she was not alone and that many others were experiencing this issue. To fill this apparent gap in the market, Alison and her dad put their heads together and looked to create a ‘one-stop shop’ service that would see these tasks completed by one business rather than multiple businesses. This idea gave birth to AAA Caring Caretaker Ltd. 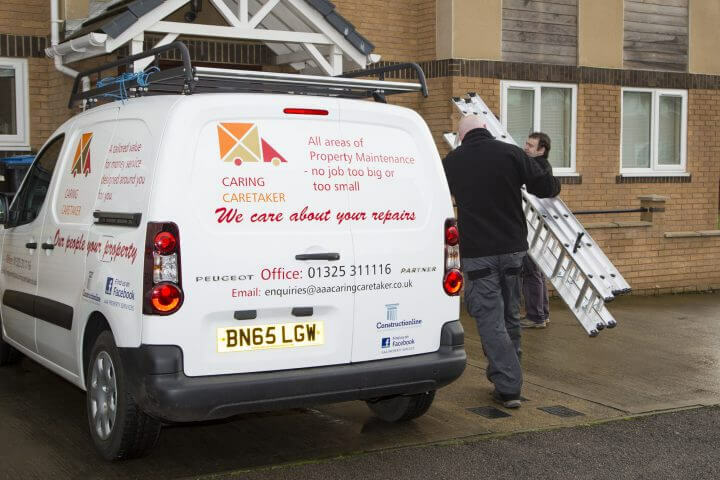 Covering a range of services including, but not limited to, painting and decorating; plumbing; roofing; tiling; electrical work, and office cleaning, AAA Caring Caretaker has successfully grown its client base, which ranges from estate agents to the NHS. Never shy to get her own hands dirty, Alison prides herself on treating her employees fairly and never asking anyone to do a job she wouldn’t do herself. Alison also has an open door policy where employees can provide ideas and suggestions. This policy has enabled AAA Caring Caretaker to attract great talent. With a growing workforce, a business owner will naturally see an increase in workplace issues. These have to be dealt with swiftly, safely and professionally. Alison found herself in a situation where a pregnant employee’s performance had declined and she was starting to receive complaints from a number of clients. As a result, workloads were falling behind and AAA Caring Caretaker’s reputation of providing the highest standard of work was failing. It was clear that they needed to find a solution. Discrimination is a complex area of employment law, and Alison knew whatever process she followed needed to be watertight and in accordance with the relevant legislation. Seeking support and advice on what process to follow, Alison turned to the Internet for inspiration. Much of the advice she found was either generic, untrustworthy or both. The complexity of the issue she faced called for more specific, tailored advice. The solution for AAA Caring Caretaker and Alison was down to pure luck. Her bank invited her to attend a Red Box event, where she had the opportunity speak to an employment law specialist providing a free workshop on workplace concerns. After a chat with the presenter, Alison booked a one-to-one appointment. The presenter was a Peninsula representative and, after a second meeting, Alison and her co-director decided to join the service. Once a client, Alison used our 24-hour employment law advice line to gain support with her situation. The ability to speak to a trained expert filled Alison with confidence, knowing she would have the weight taken off her shoulders, with the freedom to rely on someone for support. 18 months later, AAA Caring Caretaker continue to use the Peninsula advice line on a regular basis. Furthermore, they now have professional handbooks with up-to-date policies enabling them to promote the professional and fair standards they expect from all employees. With support from Peninsula, Alison gained the freedom to focus on growing and developing AAA Caring Caretaker, which resulted in them being awarded both ‘Employer of the Year and ‘Best Employer’ in 2016 by local and regional bodies. For a professional and reliable property management provider in the North East of the UK, visit AAA Caring Caretaker online at www.aaapropertynortheast.com/caring-caretaker/ or email them direct on enquiries@aaacaringcaretaker.co.uk. Don’t forget to email your own success stories to peterdone@peninsula-uk.com and we’ll profile them in our Bottom Line Newsletter, which is distributed to more than 100,000 readers.